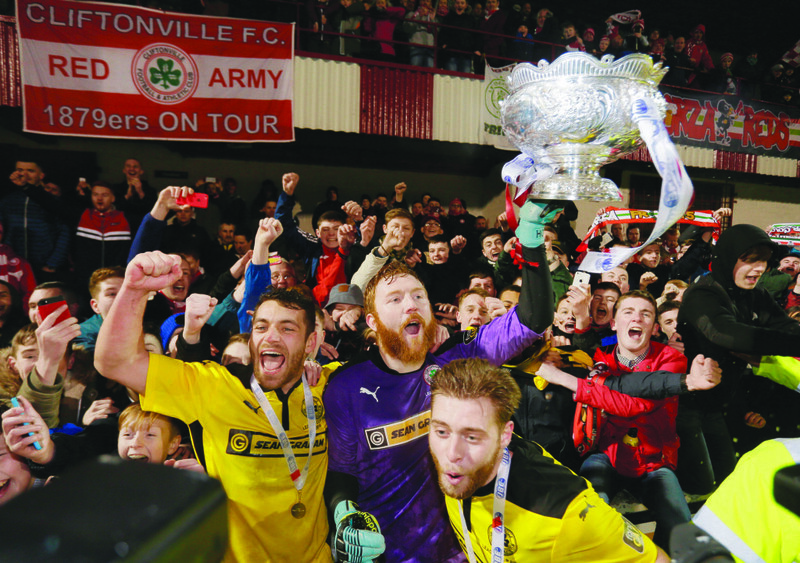 CLIFTONVILLE defender Marc Smyth insists he is delighted to be part of a Cliftonville team that created history after defeating Ards in the JBE League Cup final on Saturday evening. The 33-year old ex-Partick Thistle, Ayr United and Greenock Morton defender has overcome long term injury problems reclaim his place at the heart of the Cliftonville defence and helped Cliftonville to a fourth successive League Cup triumph. Smyth, along with Conor Devlin and defensive partner Jaimie McGovern are part of a rare trio to have been undefeated in the competition in 20-games since joining in the summer of 2012. “We were talking and I think there are three of us that have never lost a game,” said Smyth. Smyth believes that Cliftonville are capable of making it five years in a row next season and believes it will take years for someone to match the history they have created. “Records will always be beaten,” said Smyth. “It’s just reality but it might not be for a long term. Next year we could go and make it five years in a row. It won’t be the end of it after 20-games because we won’t be knocked out at the first round next year. Smyth’s appearance on Saturday was only his 13th this season. The big defender from Larne carried a long term injury from last season into this one. Having received treatment, he twisted his knee against Glenavon on Halloween and didn’t feature again until Cliftonville faced Immaculata in the fifth round of the Tennents Irish Cup on January 9. Since then, Smyth has featured in every game and hopes his injury worries are behind him. “I had injury problems at the start of the season,” said Smyth. “I never got sorted in the summer so I didn’t get it sorted until the season had started. I came back and twisted my knee against Glenavon so I’ve been in and out. Smyth believes the current group of players at Solitude are capable of going on and winning great things and believes they possess the best squad in the league. “We are capable of doing great things,” reflected Smyth. “Unfortunately with losing Joe (Gormley) and (Liam) Boyce, we were probably a bit short in terms attacking threat for maybe a quarter to half of the season. If you look at us now, we are capable of beating anyone. For me, we have the best squad in the league. “Footballing-wise, we easily have the best squad in the league, no one comes close to us in my opinion. There might be teams that are better organised, better set-up just because they have been together a while like Crusaders, but their squad isn’t better as ours. Looking ahead for the next month, Smyth believes that there is a lot to look forward to with some massive league games ahead against Crusaders, Coleraine, Glentoran, Dungannon Swifts and Linfield and the Tennents Irish Cup quarter-final at home to Linfield on March 5. “It’s been a great weekend,” reflected Smyth. “For the club and for the players its brilliant, the next month is brilliant. We’ve had the cup final, we have a game against Crusaders this week, we play Linfield in the Irish Cup and you can’t ask for any better. They are the games you want to play in. “It’s hard to motivate yourself to play Sport and Leisure and that’s no disrespect to them. We want that stadium filled with the crowd like you’ve seen tonight. Smyth believes that this season was about restructuring for the club and predicts good times ahead. “I just think this season has been more of a case of restructuring,” reflected Smyth.